I've been crunching numbers related to Ontario's electricity exports again - again in a collaboration with the hopes of having another translate my bombardment of figures into a message that will be broadly communicated. In working collaboratively, I/we work with a massive amount of data to extract a presentation supporting the point we wish to communicate. 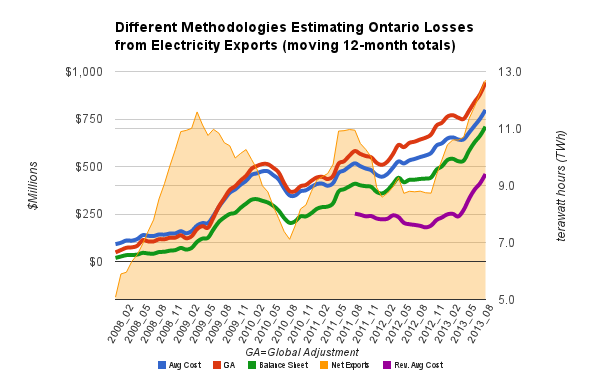 In this data geeky post, I'm going to look at statements on exports over the years, and indicate 4 different methods of estimating the cost to Ontario ratepayers of exporting electricity at very low pricing. The numbers vary widely between estimates. The problem exposed by the various estimates does not: increasing exports are now contributing to much higher rates in Ontairo. This figure can be confirmed with publicly available data. Simply take the IESO's 2MB HourlyImportExport data and line it up in a big spreadsheet with their 2MB Hourly Ontario Energy Price data (on this page); add a column for (exports-imports)*HOEP and you'll get $1.6 billion in revenue from Jan.1, 2006 - June 30, 2011. The problem comes when people think the revenue statement equates to a profit statement. If you add up net exports (exports-imports) you'd find the $1.6 billion in revenue required exporting 45.6 million MWh, making the average revenue $35.58/MWh. But what was the cost to purchase the 45.6 million MWh - and did Ontarians need to do so? Unlikely. Ontario generated about 100 million megawatt-hour of electricity from coal-fired generators over that period, and another ~44.5 million firing gas, which makes it a pretty sure bet there was at least a fuel cost above contractually committed to expenditures (power purchase agreements). So the Ministry statement is true, and meaningless. If you take only the exports (ignore imports) in the file above, total them by month, then multiply those totals by the monthly global adjustment charge, and add up the monthly totals from January 2006 to December 2011, you'll get $1.6 billion. I refer to this as the "Global Adjustment" (GA) method - and over the most recent 12 full months the estimate cost of exporting it produces is $943 million. This is a nice simple methodology because the Global Adjustment can't be charged on exports. 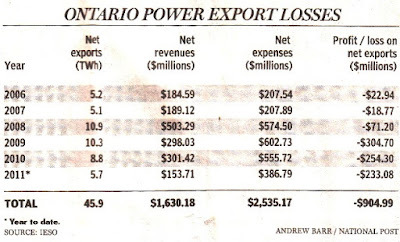 The valuation can be defined very simply as it indicates export customers paid ~$1.6 billion less for electricity imported from Ontario than Ontarians paid for the same amount of electricity (89 million megawatt-hours). A problem is that losses on exports are captured in setting the global adjustment rate, which strikes me as double accounting for the losses. I've programmed calculations that estimate the cost of Ontarians of selling exports cheaply (output is on this page) by calculating the total market value (the monthly sum of the hourly "total market demand" multiplied by the HOEP) plus the bulk total of the global adjustment, and dividing that by the total market demand produces an "average" market price; one that doesn't double account for export losses. This approach, which I'll call the "Average Cost" method, produces a lower estimated cost of exporting over the past year: $798 million. Former banker Parker Gallant, and I, estimated costs much lower than the Auditor-General did months later because we accounted for revenues, and expenses. Trying to explain this methodology might demonstrate why the Auditor used a simpler one. The global adjustment charge cannot be collected on exports, but it is collected on imports. So imports are assumed to be an expense valued at the HOEP (market price), but the revenue is valued at HOEP plus the global adjustment rate; Exports are assumed to be an expense valued at the HOEP plus the global adjustment (which is primarily the difference between the revenues guaranteed to suppliers and the market revenue), but the revenue is only the HOEP. I'll call the method Parker and I used over two years ago the "Balance Sheet" method - and over the past 12 months it produces a lower estimated cost of exporting of $710 million. In preparing this post I dove deeply into the data to filter out exports that might be attributed to the coal and and gas-fired generators that are receiving capacity payments of one type or another. The logic is that the incremental cost of these exports is really just the cost of fuel, which is assumed to be captured by the HOEP. So, assuming a world of perfect information and engineering that doesn't necessitate these plants operating beyond Ontario's demand requirement, it is assumed their generation is the first exported: the HOEP valuation is subtracted from the total cost of the system, and the megawatt-hours of generation are subtracted from the total market demand, and the average cost recalculated. This method I'll call the "Revised average Cost" methodology and over the past 12 months it is lower again - at $460 million. All approaches are imperfect. Data is always imperfect, and electricity data quality has been rapidly deteriorating in Ontario as embedded generation grows untracked. The lowest estimate from these 4 methodologies is about half the highest estimate - which seems like a significant variance. And yet, despite a difference in big numbers, all the methods tell the same tale. Exports are surging, the commodity rate for Ontario's wholesale market customers is up 25% in the summer of 2013 (over the same season in 2012), and a significant portion of that increase is due to dumping excess generation in export markets.